Over 12 years of proven track record. Book Appointment with our Relationship Managers (Next page). We are the first & largest dating agency in South East Asia with over 12 years of proven track record. We do the pre-screening, matching, date coordination and confirmation. All you have to do is show up and enjoy your date! just turn up and enjoy your date! Many working professionals choose Lunch Actually as we provide a secure, discreet and personal service that is highly-relevant to their lifestyles. Why do our members trust us? 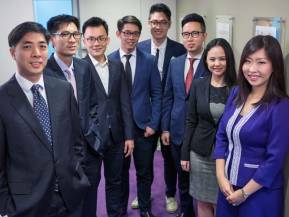 Pioneer dating agency accredited by Matchmaking Institute (New York), SDNTrust (Singapore Government) and Case Trust (Singapore). Largest lunch dating membership base in South East Asia with thousands of eligible and discerning professionals and executives. Our professional dating consultants meet up with every potential client in a private setting for a pre-screening consultation. Our proprietary SoulSeek matching system ensures that at least 85% of matches rated as good to excellent by our members. 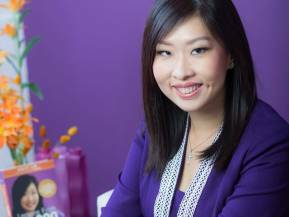 CEO Violet Lim is a published author, a trusted authority on dating and relationships, and is regularly featured in the media. Over 12 years of proven track record across South East Asia. “Lunch Actually Works!” Jeffrey and I would like to say a big thank you to Lunch Actually! 2 April 2011 was the date that changed our lives forever. We had our first date at Wheelock Place 🙂 Magical journey began for us henceforth. We simply felt so happy and blessed to be together. And so, we had our beautiful wedding ceremony in my preschool, The Kiddiwinkie Place on 20 Oct 2012. “Well Trained Dating Consultants” I met my date via Lunch Actually’s dating service back in December 2008 and we got happily married in July 2011. We highly recommend Lunch Actually to all singles and busy professionals. The dating consultants are well trained in handing 1-on-1 dates and group events. 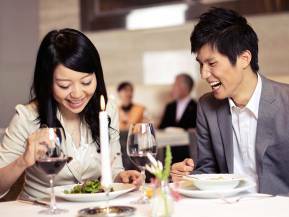 Lunch Actually’s dating service helps anyone who has difficulty in finding a date and also to widen one’s social circle. We would like to say thanks to Jamie and Violet once again for being our cupids!!! “Just One Date To Find Her Soulmate” All it took was one date, organised by Lunch Actually for Evangeline Lee to find her soul mate Fabian Lim. “My first impression of him was that he was very humorous and someone who was not very good with managing time. He was 45 minutes late!” laughs Evangeline, an internet marketer. Her wait was well worth it; the couple hit it off and was soon off to Geylang to savour durians before they called it a night at a pub along Liang Seah Street. “I thought she was pleasant looking, patient and communicated well,” adds Fabian, 38, an entrepreneur. Lunch Actually has appeared in over 3,000 media coverages in top magazines, newspapers, television and radio.